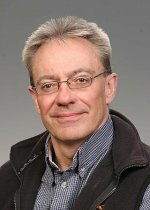 Dr. Ian Gorton was selected as a Pacific Northwest National Laboratory Fellow, the highest rank a PNNL scientist or engineer can attain. Gorton has demonstrated scientific leadership in the field of data intensive computing as well as leading the team that created the unique MeDICi technology, a software integration architecture that has broad applications for scientific and national security challenges. Gorton is the Associate Division Director for Data Intensive Scientific Computing at PNNL, managing a group of more than 20 researchers. He also served as the Deputy Initiative Lead and Chief Architect for the Laboratory's Data Intensive Computing Initiative, which positioned PNNL as a leader in the data intensive computing arena. Gorton is internationally recognized in the software architecture and data intensive computing scientific communities and receives frequent invitations to give presentations and serve on technical panels and committees. He has a prolific publication record, including dozens of book chapters, books edited, peer-reviewed papers, and invited presentations. In addition to being a regular referee for multiple scientific journals, he also served as the editor of IEEE Computer's Special Issue on Data Intensive Computing in April 2008. In 2009 he received the PNNL Laboratory Director's Award for Exceptional Engineering Achievements and was also named a Senior Member of the IEEE Computer Society.